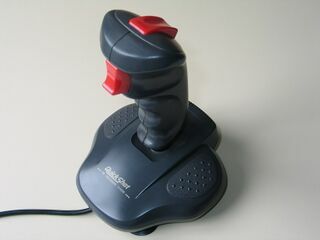 The Python 1M is a third-party joystick released by QuickShot. It is an "update" to the Python 1 - the M meaning "multi" as the controller is compatible with a multitude of home computers and consoles, including the Sega Master System. It is part of the Python series, and its Sega Mega Drive counterpart is the Python 3. The Python 1M is a ergonomic joystick with two buttons, turbo features and suction pads to grip it to a flat surface. It is otherwise fairly unremarkable. The Python 3 was adopted by Tec Toy as an official first-party Master System product in Brazil as the Manche.